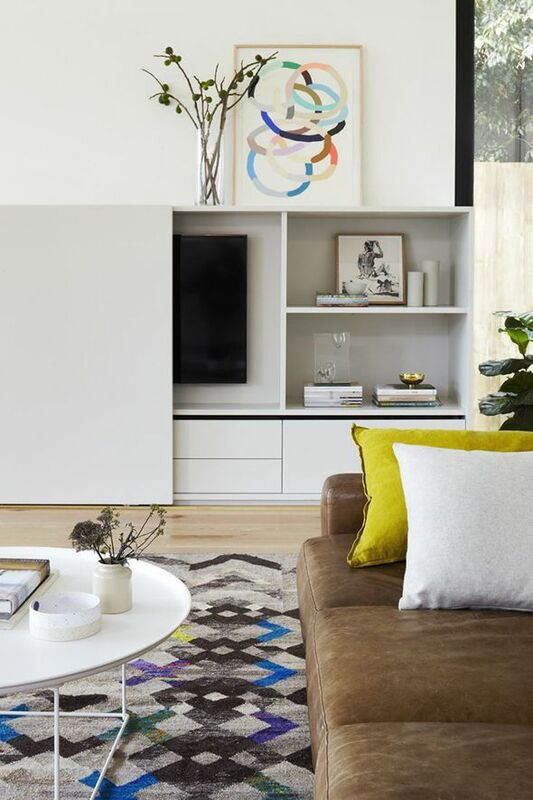 It is such a huge challenge to incorporate a TV into a room without it making too much of a statement! 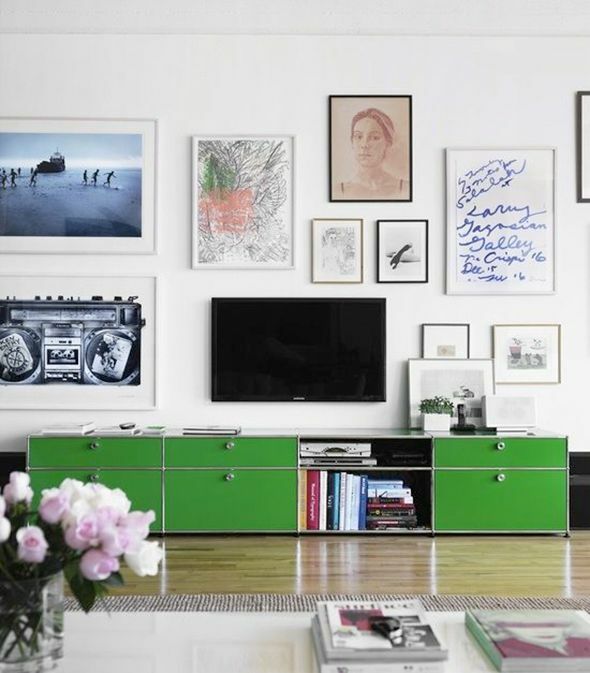 In past homes, I’ve had good luck with hanging a gallery wall around the TV. This was the stair wall in our brownstone. Hanging art all around our TV, especially a couple of bigger art pieces that were similar in size, really helped it to fit into the gallery wall. 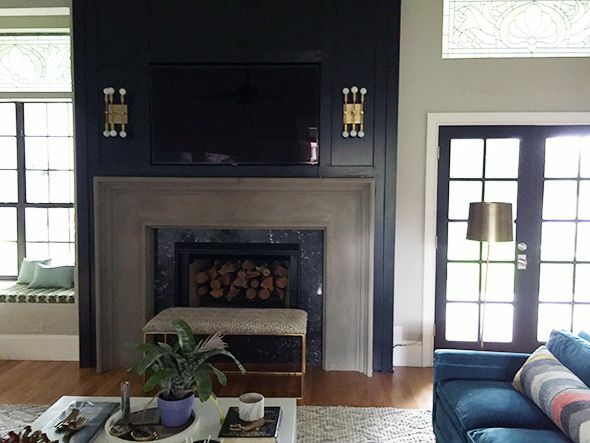 In our current home, we had our carpenter build a nook for the TV into the fireplace surround, which I painted black. I think it really helps to camouflage it when it’s not on! Recently I had to snap some photos of this great idea I saw in my husband’s office building. 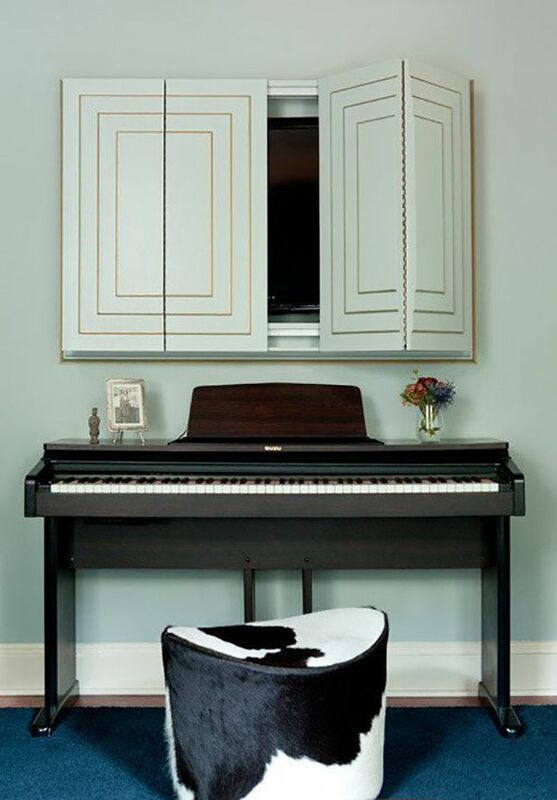 I thought this beautiful frame was such a clever way to conceal the sides of the TV and the wiring. And here are a few more of my favorite solutions. Most of these require some “building in” the way that my fireplace solution did, but check out what a difference it makes! 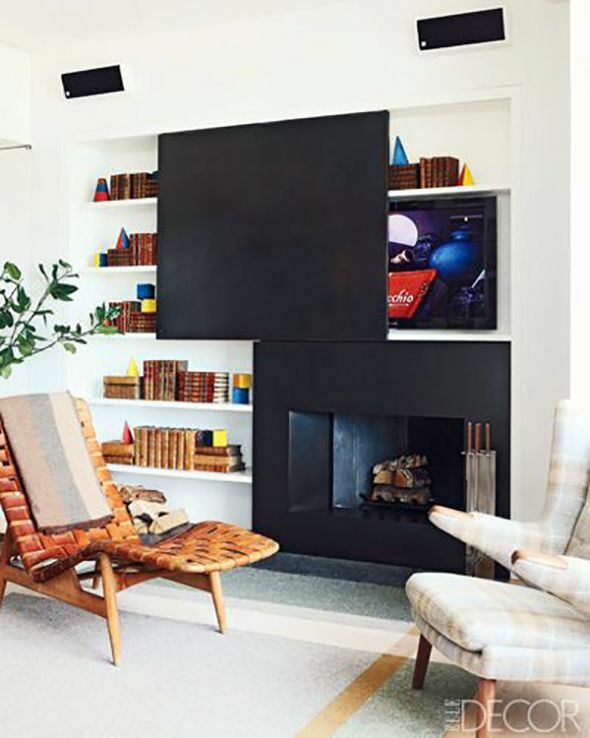 All of these rooms look amazing, despite the big TVs! Cool, right? I’m dying to try one of those last two ideas in my bedroom! 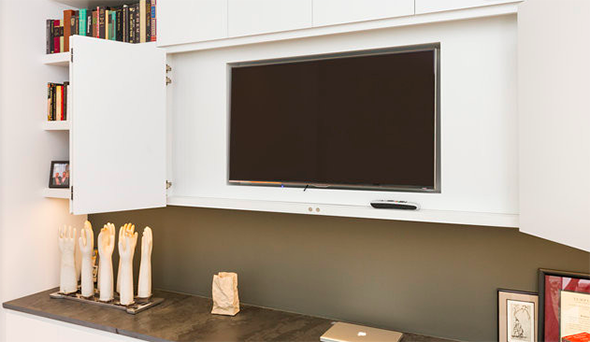 Have you had any luck with a great TV-hiding solution? Oooh yes. The TV wall is currently the least favorite spot in our library. The TV sits above our mantel, which is frankly not my favorite place for a television, but it's the only one that works in that room. We're slowly working on a gallery wall to surround/ camouflage the TV, but since I'm trying to be deliberate about the art we bring in, it's a slow process. 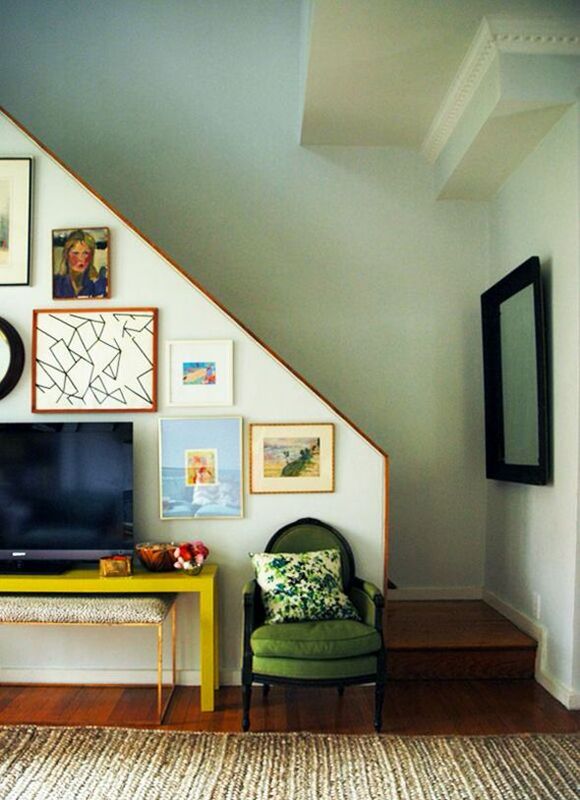 Love the way your TV is hidden, and those gallery wall inspiration shots are just what I need! This is a really great round-up. Thanks! Great roundup! We're moving to a small Cape style home and the living room has only one wall that's not broken up, then the stair well, a wall with a large picture window, and the fireplace with built ins. Our fireplace are isn't as structurally interesting as yours so it wouldn't mask the tv very well. I'm thinking of 'hiding' the tv in one of the built ins but putting it on an arm so we can extend it out when using it. This is so timely! We are completely reworking our fireplace and adding our tv. I was JUST looking at one of your old posts last night where you show the build out of your new fireplace. I love the mouldings (handrail too?) that you used for the mantle and am wondering how close I'll be able to come to replicating yours ;) I find the moulding aisle at Home Depot dizzying! I see you updated the color of your mantle. It looks beautiful! Like kind of chalky…Is that a paint finish, or concrete? Thanks! 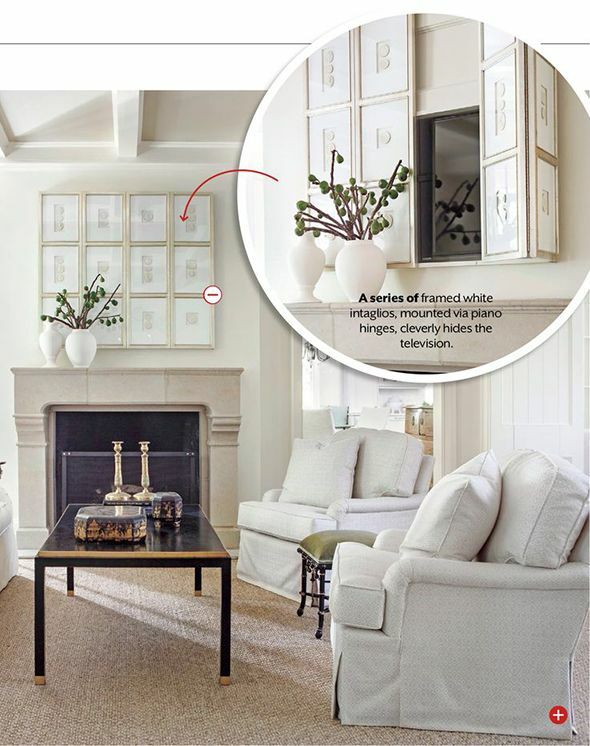 I recently worked on a house where the tv was mounted above the fireplace, and art was hung over it. We installed an art lift to lift the art up so you could see the tv. 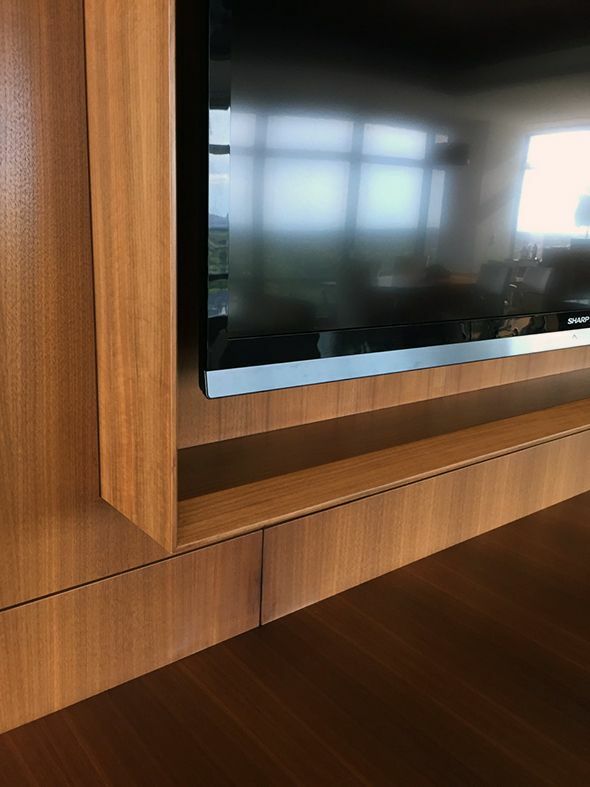 In my house, I just have my tv on the wall with a skirted console below. I have small oil paintings on either side of the tv. Great post. I personally do not like TV's hanging on walls… I purchased a flat screen to fit in my armoire. The armoire is a statement piece in the room instead of the tv. 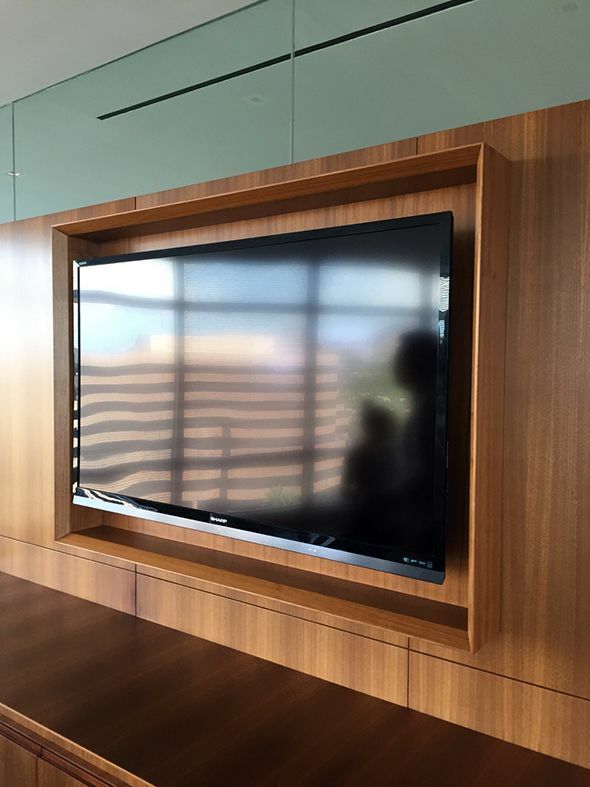 I love the ideas you posted especially the artwork that hinges open to reveal the tv..how clever! I found it fun to frame my television with carefully planned out art as well. Recognize the art? We hung a large, vintage pull-down map (it came from an old school) in front of our tv. It's a little funkier (well, actually lot funkier) than many of the options shown, but it fits our sort of bohemian-farmhouse vibe pretty well. And, as a bonus, when we aren't watching tv we can study the various "Land and Water routes of Westward Expansion" which is what the map covers. Yeah! We use a protector ! When we are done using it, it just turns off. No sign of any screen!! Haha. And it projects so huge! The same price for a flat screen that size would be expensive!